Andrew and Annedria Beckham are the owners of a boutique winery located on the flank of Parrett Mountain in Oregon’s Chehalem Mountains AVA. They are like other young, winemaking couples we’ve met who seek a rural lifestyle where they can safely raise children and grow grapes and perhaps make wine on the side. Except they took their grape growing and winemaking seriously, and Andrew, who is a ceramics teacher, decided to apply his pot-making skills to wine. The Beckhams planted their first two acres in 2005, clearing the land and then planting cuttings of Pommard, Wadenswil, and Dijon 115 clones of Pinot Noir on extremely rocky, volcanic soils. They now have 6.5 acres of dry farmed, organically cultivated vines in the Chehalem Mountains appellation, mostly Pinot Noir but, also, some Riesling. They also purchase Grenache grapes from the Rogue Valley in southern Oregon. Andrew learned viticulture and winemaking on the job, with Jim Sanders of Aubichon and Mike Halleck of Carabella Vineyard as mentors. Annedria previously served as Executive Director of the Chelhalem AVA. 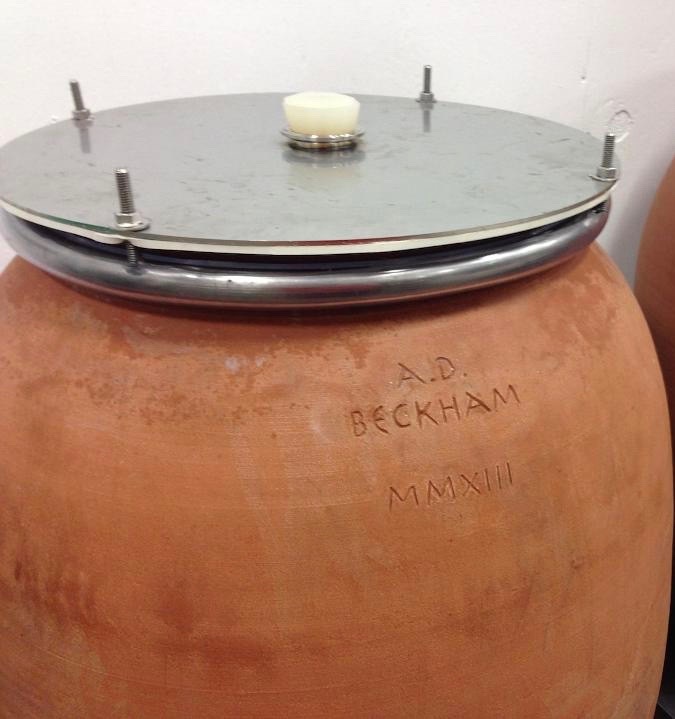 While the Beckham wines that are fermented in the modern style are very good, it’s the ones made in clay vessels that are most unique. Andrew says that the fermentation in clay isn’t as fast or hot as stainless steel, and clay lets in more oxygen than wood barrels during aging, so they mature faster. In addition, clay is a stabilizer and fining agent, resulting in wines of exceptional clarity without filtering. But the most important difference according to Andrew is the texture of the wine, which he describes as earthy with a ferrous or brick dust quality. Andrew has been experimenting with different shapes—bulbous ones like the Georgian kvervis or Chilean tinaja or th e Roman dolia—and more conically or egg shaped amphoras. He’s also trying different firing and glazing protocols so he has a menu of options much like barrel makers do with their toast levels. He doesn’t like his vessels with beeswax as they do in Georgia as it’s costly and unsanitary. Instead he finds a firing temperature that results in a vessel that’s both leak-free and porous. Each firing takes almost 40 hours. 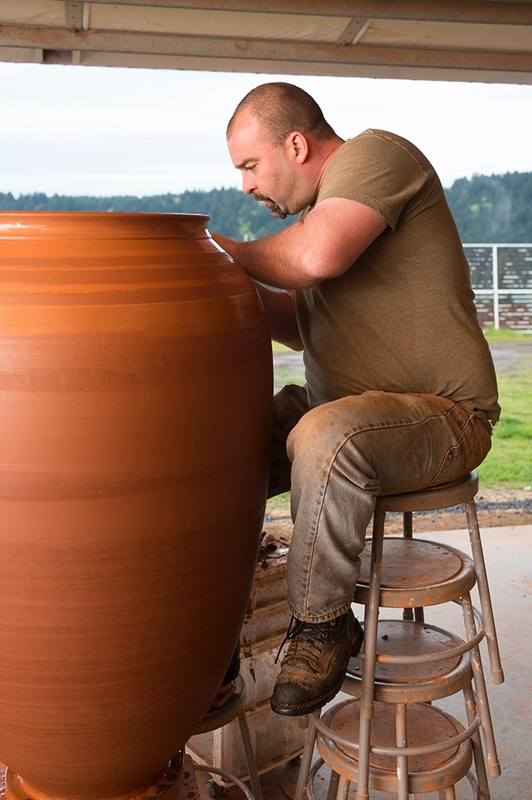 He currently makes vessels in 350L and 500L sizes but will soon be producing a 1000L. When the Beckhams submitted their 2016 Pinot Noir Rosé for our annual review article on rosé wines, Annedria offered to also send samples of their amphora wines. Since we had recently tasted wines made in traditional Chilean tinajas at our visit with winemaker Marcelo Retamal at the De Martino winery in Maule, we were clearly interested. We later had a phone conversation with Andrew to learn more about his winemaking and his booming amphora production. We encourage readers who are not familiar with natural wines to try the very flavorful, interesting ones made by the Beckhams. A.D. Beckham 2015 Amphora Pinot Gris Willamette Valley ($38) 91 Scents of red plum and Montmorency cherry give way to a savory, light red-garnet colored wine of medium density with hints of cherry skin, underbrush, and herbs. This is a flavorful, interesting wine with a light saline note. Fermented on the skins in amphora and aged 50/50 in amphora and French Acacia barrels. Andrew says that the Acacia adds spice without the sweetness of oak. This wine reminds us of the outstanding macerated Pinot Gris we recently tasted at La Castellada in Collio. A.D. Beckham 2015 Amphora Grenache Rogue Valley ($40 ) 92 The medium weight Grenache shows incredibly fresh light red fruit. Impressive in its purity, brightness, and refined texture. This wine is fermented in amphora using native yeast, 85% whole stem, and matured 50/50 in amphora and neutral oak. Sourced from the Rogue Valley in Southern Oregon. A.D. Beckham 2015 Creta Amphora Pinot Noir Chehalem Mountains ($55) 89 Made from estate fruit, The Creta Pinot Noir is fermented using native yeast and aged only in amphora using 25% whole cluster. Showing earth and spice, it’s a distinctive wine that reminds us of Louis-Antoine Luyt’s naturally made Pinot Noir that we tasted in Chile last year. Beckham Estate 2016 Pinot Noir Rosé Chehalem Mountains ($22) 91 Medium salmon pink. Showing fragrance of red cherry skin and rose petals, this is a mouthfilling rose with brisk natural acidity and super fresh nuances of pomegranate and red cherry on the palate. Shows superb balance and precision. Direct pressed, fermented and aged in neutral barrel. Beckham Estate Vineyard 2014 Estate Pinot Noir Chehalem Mountains ($30) 91 Showing dark cherry and earth on the nose, this is a well-made Pinot Noir. It has a silky mouth feel, good concentration of dark cherry fruit, and fine firm tannins. Made using two ton open top fermenters and aged in 20% new French oak for 15 months. This entry was posted in Oregon, Pinot Noir, Red Wine, Rosé, Uncategorized, White Wine, Wine Type and tagged Chehalem, Natural Wine, Oregon. Bookmark the permalink.